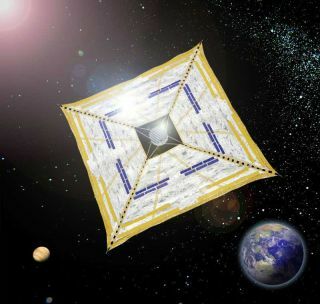 Japan's Ikaros could become the first successful solar sail flight using sunlight propulsion, and the first interplanetary sail. An ambitious solar sail mission designed by Japan is poised forlaunch tomorrow could become the first successful mission powered solely bysunlight, but that's not all. The spacecraft is also aimed at Venus and beyond,and could pave the way for a future hybrid space engine. The solarsail will hitch a ride aboard an H-2A rocket slated for launch on Monday(Tuesday local time) from Japan's Tanegashima Space Center. That rocket carriesthe main mission of the Japan Aerospace Exploration Agency (JAXA), the VenusClimate Orbiter called Akatsuki — which means "Dawn" in Japanese. But only Akatsuki has a planned meet-up with Venus, eventhough the sail — called Ikaros(Interplanetary Kite-craft Accelerated by Radiation Of the Sun) — will alsolaunch along the same trajectory toward the mysterious planet. "This will be the world's first solar powered sailcraft employing both photon propulsion and thin film solar power generationduring its interplanetary cruise," said a JAXA mission website. Venus would mark just a six-month pit stop for the solarsail during a three-year trek toward the far side of the sun. "To me it's a very bold activity to be conducting atechnology test like this on an interplanetarymission," said Louis Friedman, an executive director of the PlanetarySociety in Pasadena, Calif. "I think it shows a lot of foresight on theirpart." Past solar sail demonstrations have fallen short ofachieving actual solar-propelled spaceflight, but that certainly has notstopped JAXA from planning an ambitious technological debut. Even Ikaros itselfrepresents just a stepping stone to a "hybrid" space engine that incorporatessolar sail technology, mission planners have said. The kite-shaped Ikaros relies upon the pressure of sunlightfor propulsion, but it also carries thin film solar cells built within itssail. Such cells could generate electricity from the same sunlight pushing thesolar sail along. That won't do much good by itself for a solar sail withoutan engine. But JAXA hopes that the power-gathering demonstration couldeventually lead to spacecraft with ion-propulsion engines that draw electricityfrom solar cells and also take advantage of solar sail propulsion — a hybridpropulsion system. "They want to ultimately have a solar electric [ionpropulsion] and solar sail vehicle that would be used for outer planetarymissions," Friedman told SPACE.com. Yet the history of solar sail tests presents a soberingreminder of the troubles that can arise. The California-based Planetary Societyattempted to fly its Cosmos-1 solar sail in 2005, but lost their prototypebecause of a Russianrocket malfunction. NASA's NanoSail-D was also lost in the third failedflight of SpaceX's Falcon 1 rocket in 2008. A British shoebox-sized mission slated for launch next yearmight also test solar sail propulsion, but would mainly test the sails asbrakes for takingdefunct satellites down. Japan did deploy a solar sail from a sounding rocket in2004, but did not actually attempt to demonstrate controlled flight. If thatrepresented the dry run, then Ikaros comes as the real deal. Ikaros is designed to unfurl its sail during its first stageby taking advantage of its spinning momentum, and then actively deploying therest of the way during a second stage. "The membrane is deployed, and kept flat, by itsspinning motion," the JASA mission website stated. "Four masses areattached to the four tips of the membrane in order to facilitatedeployment." The Planetary Society still has ambitions to someday launcha solar sail mission into deep space, but its first planned solar sail testwould involve a much smaller spacecraft than Ikaros, which stretches almost 66feet (20 meters) at the diagonal of its square sail. A refitted NASA solar sail might weigh a little less than 10pounds (4.5 kg) compared to the 700-pound (315 kg) Ikaros. The Planetary Society would aim first for launch tolow-Earth orbit, before eventually launching a second mission that lastedperhaps weeks. Only the third mission would try for interplanetary travelerstatus, Freidman said. For now, Friedman and the Planetary Society will sharetechnological information and results from the JAXA mission, and keep an eye ontheir own hopes for the future. "We wish we were first, of course, but it doesn'tmatter," Friedman said. "It's about advancing solar sailtechnology."